Hello everybody, My latest blog to you was going to be about walks I have been discovering in the area but I can’t get to that until I have told you about the weather! I don’t know a human word that could describe it, but I will say that as a very mature 2 1/2 year old with all my experience of life, I have never seen anything like it. It has rained and rained and rained and rained a bit more. Very sadly some of the houses in our village have been flooded but as we are on a hill my bed was dry. One good thing came out of all the rain And that is a whole new wardrobe for me! I now have a new raincoat referred to as “Baxter’s Devon Attire”. 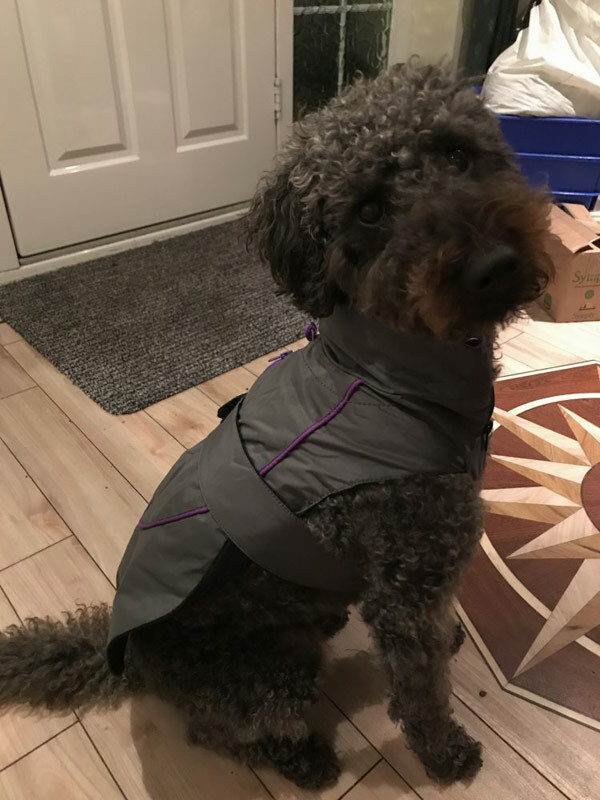 I have attached a photo for you to see me in my new coat, needless to say I look extremely handsome in it and it does keep me dry, which is very important as I do shiver if I get too wet. It has also helped as all this rain has been playing havoc with my curls, meaning “Fuzz Ball” has been added to the list of ridiculous things I get called. Despite the weather I have discovered some lovely walks. Today I took my humans for a circular walk from the car park at the beach in Combe Martin, we followed the South West Coast path from the car park to Little Hangman and then over the summit of Great Hangman. before dropping back down into Combe Martin, the whole walk was 5.6 miles long, it was very steep in places, but well worth the climb. For an easier walk my new favourite is Westlandpound reservoir which has a number routes around it on clearly marked paths. For more information please click here. A little bit further away from us is a very picturesque walk from the National Trust Car Park in Croyde take a circular route out to Baggy point for some amazing views along the coast please click here. I have more to tell you about but I will save those until next time. When you come to visit me I will be able to give you full details of these walks and I will even get the humans to print a map for you.